Known for its endurance, the English Setter is most commonly used as a bird dog, as well as being a good pet. English Setters are very peaceful dogs that are great with children. They are affectionate and enjoy human companionship. They are fairly inactive indoors, but when outside they love to run and play. When choosing an English Setter, look for elbow and hip dysplasia, deafness, and thyroid problems. Breed Type The English Setter is a sporting breed known for its endurance. They are most commonly used as bird dogs. Background The English Setter is believed to have originated over 400 years ago. Its lineage may have included the Spanish Pointer, Water Spaniel, and Springer Spaniel. The breed was first shown in 1859. Description The English Setter is white, speckled with blue, lemon, orange, or brown. Its hair is silky and long. The muzzle is fairly long and square, the eyes large and hazel, and the ears long. 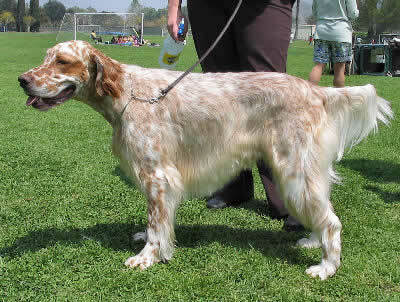 The English Setter's tail is long and fringed. Males measure 24-27 inches tall and weigh 55-80 pounds. Females are 23-26 inches tall and weigh 45-70 pounds. Care and Feeding English Setters need logs of carbohydrates and fiber, and low protein in their diets. The best foods contain poultry, lamb and brown rice. They are prone to weight gain, so it is important not to overfeed. English Setters should be combed and brushed regularly, and bathed only when needed. Feet need special attention, including trimming the bottoms of them and clipping nails as needed. This breed sheds moderately. Regular vacuuming is necessary if kept inside. Housing Your Dog The English Setter is best suited to outdoor living. If kept indoors, it is crucial to let them out to play regularly. Social Behaviors English Setters are great with children, and they enjoy having other dogs around to play with. They also need plenty of human companionship. Handling and Training The English Setter is a strong-willed breed, so training should be started early for best results. Housebreaking may be difficult. Activities English Setters need plenty of exercise, including a daily walk and plenty of time to play outdoors. Breeding/Reproduction This breed is not very prone to genetic disorders. When selecting a mate, the main things to look for in the bloodline are hip and elbow dysplasia, deafness, and hyperthyroidism. Common Health Problems Female English Setters sometimes have false pregnancies. Joint problems and obesity are common ailments. Both of these can potentially be prevented by carefully monitoring your dog's weight. Availability English Setters may be difficult to find in some areas, but can be located online. Prices usually run between $400 and $800. I have a 63 lb male English Setter who is a great hunter, obedience is fair to good and great pet. The dog does not see well at all in bright light. Days without bright light he sees very well. Wondering if this is normal or not. English Setters are wonderful dogs but they are dreadful puppies! If you can survive the first 18 months with one, you are home-free. You will need an ample supply of bitter-apple products to protect your wooden furniture (particularly chair legs) and I would strongly advise obedience training. But they really are fantastic dogs once they mature - loving, loyal, sweet-natured and cuddly. Sounds like you were busy ---- they are excellent pets though. Puppies can be a pain at times but they are cute. You are SO right about them being dreadful puppies! Ours wasn't a chewer but was always into or up to something. He's such a good boy now at two that you'd never know he was such a little hellion for the first few months! Stop...don't believe everything you read (on the internet in particular. )I've had many dogs of all breeds - 'drop-out' seeing eye dogs, dogs from'Pet Finders.com,' - etc. My only 'pure' dog was kind of pushed upon me by my youngest daughter. Her first great love was the son of a family who, for generations, has bred and trained champion fied trial and bird hunting, English setters. I have to admit that my Grouse Ridge English Setter is the greatest, loving addition to our family. That INCLUDES from her puppy-hood. GROUSE RIDGE ENGLISH SETTERS are supreme Englisg Setters! Hey! That's my dog, Luke! Luke is one beautiful dog!